Educating the next generation of sailors is an important job, but it’s not necessarily easy or intuitive. We interviewed Quantum Sails expert Dave Gerber and Snipe sailor Kathleen Tocke on their experiences coaching kids, the techniques they use and what they recommend to make the experience a success for everyone. The next generation - Spencer Gerber readies his Opti before a practice with his brother and dad, Dave Gerber. This two-part interview is a short guide to working with today’s youth sailors. You will find sample drills, communication techniques and how or when to best present constructive coaching. Both Dave and Kathleen are active racers and acknowledge they also continue to evolve as students of the sport; they make a point, they say, of following the advice they share with others. In addition to being a world champion pro-sailor, Dave is a Quantum's sail consultants out of Traverse City, MI and is high school sailing coach and father of six. What is your best advice for a new coach? Each one should take 15-30 minutes. Name them something exciting, i.e. : tiger drill, hit the bottle, tack on the whistle, or giraffe; that way it is easy for the kids to remember and pass on to others. Always try to run a practice with two hours on the water. With rigging and derigging, you will probably find a total of three hours is perfect. Keep a list of “base drills” to fall back on if something goes wrong or things get out of control. I have three of these that the kids already know and are both simple and fun. 3:00 pm Kids or high school students show-up to rig boats and visit with friends. 3:20 pm Get dressed while we have chalk talk/ discussion about the day’s practice. 3:40 pm Launch and sail. 4:00 pm Drills start, run practice/drills for an hour to 75 minutes. 5:15 pm Run races or some type of fun drill to end practice. I like to do a crew-race, race to the dock, or something different, always mixing it up. 5:30 pm Hit the dock to derig, change and debrief to be done by 6 pm. My goal is to always keep it fun, make sure the kids learn something every day and grow their love for sailing. The same approach works for kids of all ages. Have land-drills or an alternate plan if the weather goes bad. High school kids are pretty spent after a day of school; if we can’t sail we do some sail coaching/learning, or maybe tour a local sail loft or boat shop. And I’ll always try to include some type of team game: ultimate frisbee, soccer, kick-ball, anything active. How do you gain respect from a group of students? I engage them in conversation; show them I respect and care about each person as individuals. I make sure I know what is going on outside of sailing and relate to them be it with academics, extracurricular activities, prom, etc. This is the best way to build a relationship and gain respect. I also want them to learn life lessons and know they can come to me if need be. Last piece of advice to coaches? You have to enjoy working with kids in order to be an effective coach; the will to work with youth must be there. Kathleen has coached Rhode Island’s FAST team in both the Optimist and Laser classes, the RIOT Optimist team and various New England high school teams. She recently started the Techno youth windsurfing program at Biscayne Bay Yacht Club and has spent time coaching International 420s in the Bahamas, Italy and Canada. When things start to get chaotic, how do you control the situation? It can be helpful to have two coaches on one boat, this allows for kids to still come and receive coaching if the other is working with a breakdown. I’ve even taken another person on the water with me so that when multiple kids come for coaching at once, I can hand my notebook to my coaching partner to read the coaching notes I recorded from the race. As a coach, always have a ‘big picture’ explanation for the races, this way you can ask each racer where they went on the race course to help them figure out why something worked or didn’t rather than giving answers. New venues, rough weather, and event qualifications seem to be the biggest stressors; I help calm nerves by reminding kids they have practiced in similar conditions before or that other competitors are trying to qualify too; they are not the only ones in that position. How do you best challenge a wide variety of abilities and learning styles in the same group? During practices, I always sit down with the group ahead of time and make sure they know we will regroup often throughout the day. I want them to know that the kids who get ahead won’t learn from being far ahead, nor will those behind, so I might tell them to take a 360 or 720 during a practice race. It is sometimes difficult to enforce this. I’ve found that if I tell the group, ‘everyone knows who is winning the drill but the best sailors are those who are behind and have the ability to sail through the fleet,’ they are more willing to do the circles when asked. I also make it clear that spinning circles is a skill, and if they have to do them during a race, it’s better to look graceful and know the skill! What is your favorite drill to run? I call it the Tranquillo Drill, I created it for students new to Optimist sailing. It’s a pre-start routine to calm their nerves. There is an imaginary box to windward, starboard side of the race committee boat, they have to stay there until 20 seconds before the start and then can come down to the line in time to stop their boat on the line, accelerate and go. The reason I love this is it takes kids away from the constant circling and chatter on the starting line, as well as giving them a chance to look upwind and the current conditions. It’s a way to focus on themselves without many distractions and remain close to the line. When they are beginners they are more comfortable sitting and holding a position in the box area; eventually they realize they can use the skill to sit on the starting line at two minutes, which takes more courage for newer racers. The other skill I always practice is reaching. This doesn’t get taught very much in the U.S. and if sailed well, is a great tool for passing boats! How do you talk differently to kids versus adults? Give big nuggets versus many nuggets. Coaches often overload kids, which will sound really good to parents as they listen in, but won’t do the kids any good if they don’t retain anything. I’ve also come to learn that when asked if something makes sense, youth will nod along when they really don’t understand. I focus on the core concept and repeat several times. A tip for fellow coaches: kids remember better if coaching is paired with a compliment, especially when they are tired! What is the best way to coach the back of the fleet? One of the biggest frustrations for kids is they don’t always know why they lost and why other kids won; they are so consumed in their own race that they aren’t watching and learning from others. It is very important to provide a big picture explanation after racing. I always find one thing that the kids at the back of the pack are doing well and keep emphasizing it during race days, then I can bring coaching back to practice. 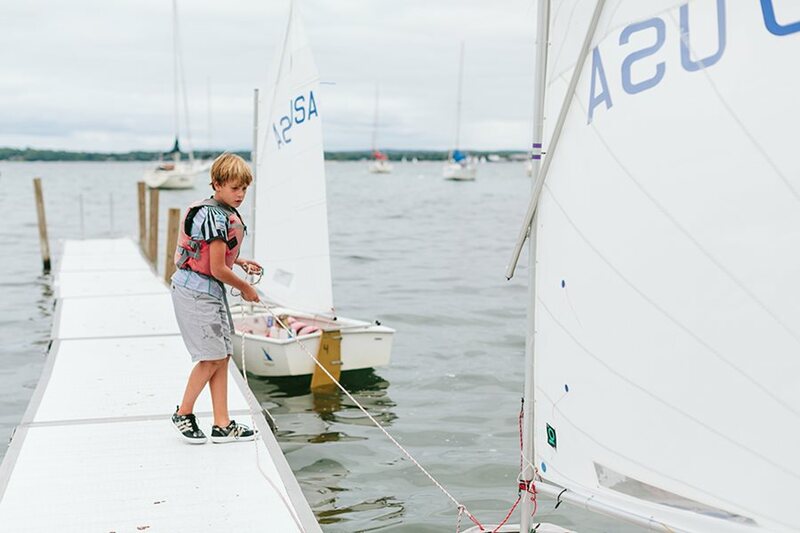 Two things: first, it is important to remind kids there are different coaching and sailing styles and it is important for each person to try different methods in order to find what works for them. Explaining this to the group helps avoid the situation where a student says a parent or coach taught them a different way. Second, always carry a toolbox and some electrical or duct tape!